Type locality Mozambique (Camponotus (Myrmoturba) compressus F. stirps probativus n. st., Santschi, 1921d: 73 (footnote), major & minor workers) Delagoa; major & minor workers only described (see Bolton, 1995). I have included this as a full species as the supposed substantive species Camponotus compressus is known from India across to North Africa but nowhere else in sub-Saharan Africa. .
Santschi's (1921d) brief description is at ; his comparison is partly with Camponotus (Tanaemyrmex) sexpunctatus. 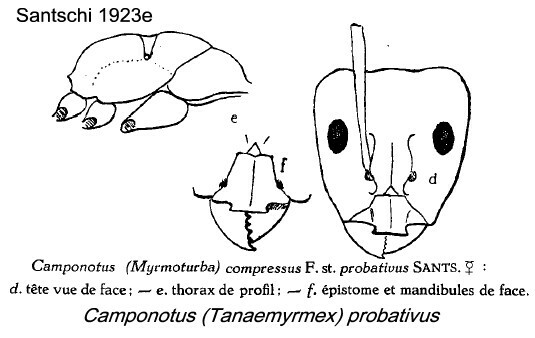 Santschi (1923e: 291) provided an illustration of probativus, in a comparison with Camponotus maculatus variation beta of Arnold (1922: 639) - which Santschi reckoned not to be var melanocnemis. Arnold's (1926) gave a translation and further description, with his earlier (1922: 634) notes; these are at . I find the comments confusing but it may be that this and sexpunctatus are identical, in which case the latter is the prior name. However, alternatively it may be that the latter is a separate entity and is a subspecies of maculatus. The type image label (below) shows the Forel label referred to by Santschi. 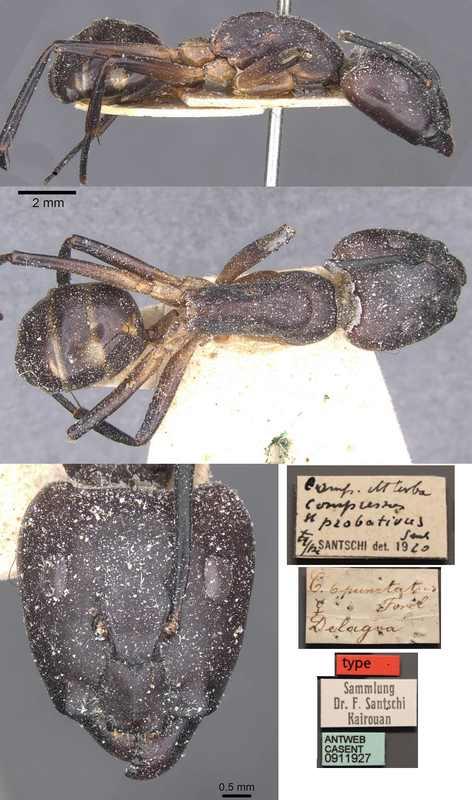 The photomontage of the type major worker is collated from http://www.antweb.org/specimen.do?name=casent0911927.